Its that glorious time again when I receive my GLOSSYBOX subscription , I just love the anticipation , off opening the box and seeing what's inside . September's 'The style edition' box did not disappoint , to start with the box itself is just gorgeous , and I will defo be keeping it. 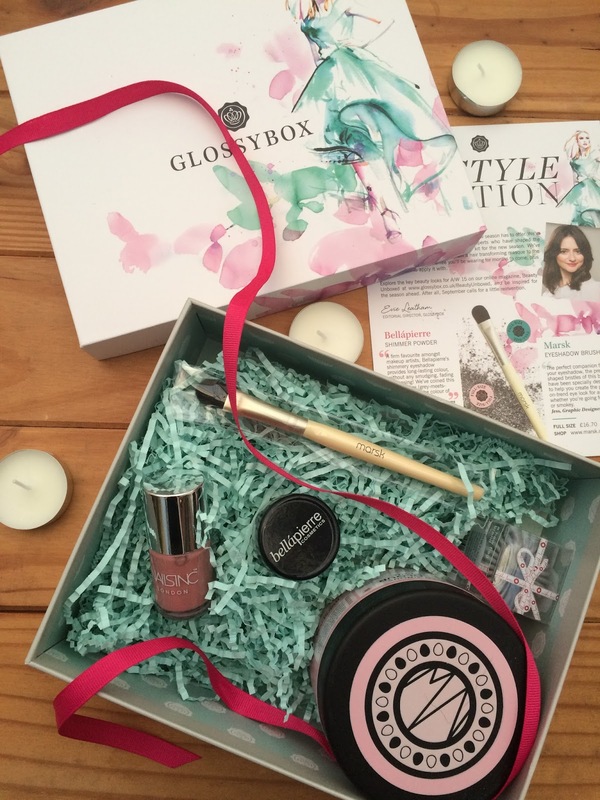 Inside the this month I got five full size products that Glossybox say is 'everything you need for a new season' . The product's value is over £60 which is awesome as you only pay £10 a month subscription fee. Whoever decided what was to be in this month's box must of read my mind as 2 of the things I got, I had been planning on buying , I'm desperate for some new make up brushes , so was pleased to find the Marsk eyeshadow pro brush , which normally retails at £16.70 in my box . I have already tried it and it's a fantastic quality brush. I also received a Nails Inc polish in a cute dusky pink shade, which looks pretty and I look forward to trying it . The polish retails at £11. Next up is the Bellapierre shimmer powder , I have tried this and it's a lovely grey/beige colour shimmer eyeshadow which I found to be long lasting and with no fall out when applying. Overall I was very pleased with what was in my September box and plan on using everything I got. I would recommend Glossybox to anyone who likes to try new beauty products for the bargain price of only £10 a month. Do you like the look of this month's box ? I would love to know. Found your blog whilst looking for Glossybox reviews. Love it :). We got similar boxes this month! Ahhh I love Glossy Box! Great contents this September! Just followed your blog & will stay tuned with your updates. Stop by my blog, say hi :) I love discovering new great bloggers!